Novak and Montague leave Time Warner’s offices in New York after an appearance on CNN. 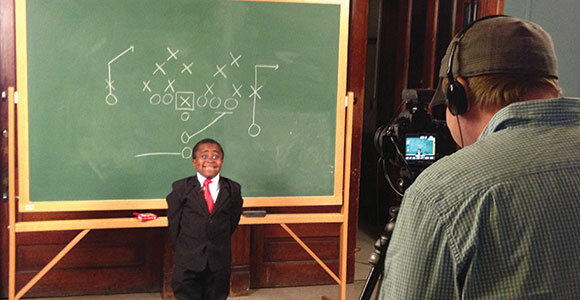 Kid President is a tiny, suit-wearing star with a simple message: Make the world a better place. In the last year, his humorous videos on YouTube have racked up millions of views and given him the opportunity to work with people like Steve Carrell, Rainn Wilson, Beyonce, Justin Timberlake and even the actual president, Barack Obama. Brad Montague and Robby Novak, his 10-year-old brother-in-law, are both from Chester County, along Southwest Tennessee Electric Membership Corporation lines, and are the creative team behind Kid President. 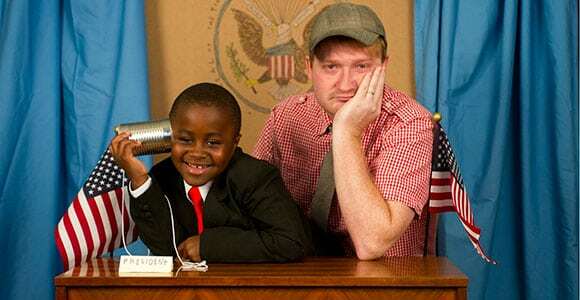 Kid President was the result of a conversation about what the world would look like if a kid were in charge. The two built a set out of cardboard and set up a camera and lights. 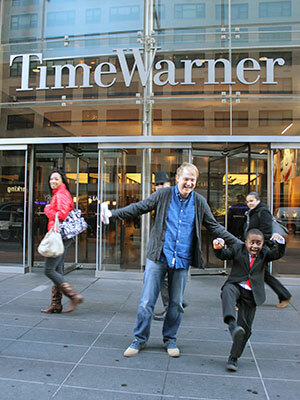 Robby Novak hams it up as “Kid President” while his brother-in-law, Brad Montague, films. Their videos, filled with positive messages of encouragement, have been viewed by millions around the world. The pair filmed a lot the first time around and made three videos out of the footage. “We were just trying to figure out what this was,” says Montague. 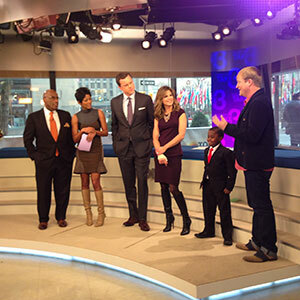 Novak and Montague on the set of NBC’s “Today” show. “We were shocked by the response,” says Montague. “Within the first few days, the video had been viewed more than 100,000 times, and we were getting phone calls from the ‘Today’ show.” The video has now been viewed more than 31 million times. Montague is using their influence to give kids a voice and the opportunity to make the world a better place. Many of their videos highlight causes and organizations that kids can get excited about — like providing school desks and soccer balls for students in third-world countries. In October of 2013, Kid President encouraged followers to participate in “Socktober” — a call to serve the homeless in their own communities, even in ways as simple as donating a pair of socks. They received stories of people taking action from every state and around the globe. Novak with fellow YouTube sensations Lennon and Maisy. Today, Kid President is focusing on finding opportunities for kids and adults to work together to make the world better and celebrate family. People around the world are paying attention. Kid President was asked to help with the United Nations’ World Humanitarian Day, an event designed to celebrate the spirit of people helping others. They also traveled to Cannes, France, to speak at the Cannes Lions International Festival of Creativity. 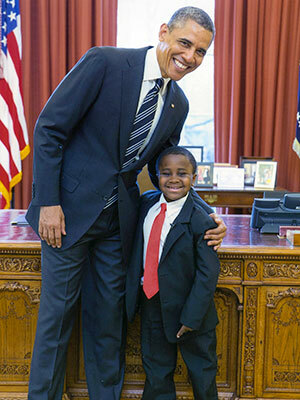 Kid President meets real President Barrack Obama and gets a tour of the Oval Office. In 2003, Montague’s in-laws, David and Laurie Novak, began fostering and then adopted Robby and his sister, Alexia. They were born with a genetic condition called osteogenesis imperfecta, better known as brittle-bone disease. This means their bones can break very easily, sometimes for no reason at all. In many of the Kid President videos you will see Robby wearing a cast. There is plenty more to come in the world of Kid President. You can watch the videos and learn about opportunities to get involved at kidpresident.com or by following @iamkidpresident on Twitter.